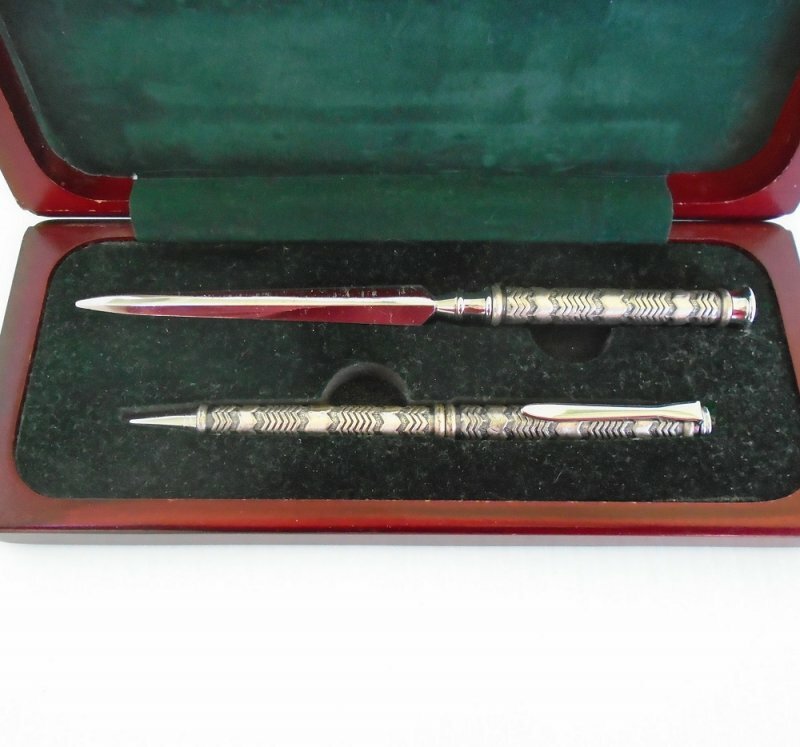 Vintage 1960s desk set consisting of a pen and letter opener, silver in color. Housed in a cherry wood box. Complete set is in excellent condition. The writing pen and letter opener in this set is silver in color only. They are housed in a beautiful cherry wood box. The top of the box is engraved with the name 'Lee'. The pen and opener are not engraved. Neither piece is hallmarked. The pen measures 5.5 inches long and still has ink in the replaceable cartridge. However, I do not know how much ink remains. The letter opener measures 6.5 inches long. Both pieces are in wonderful condition. 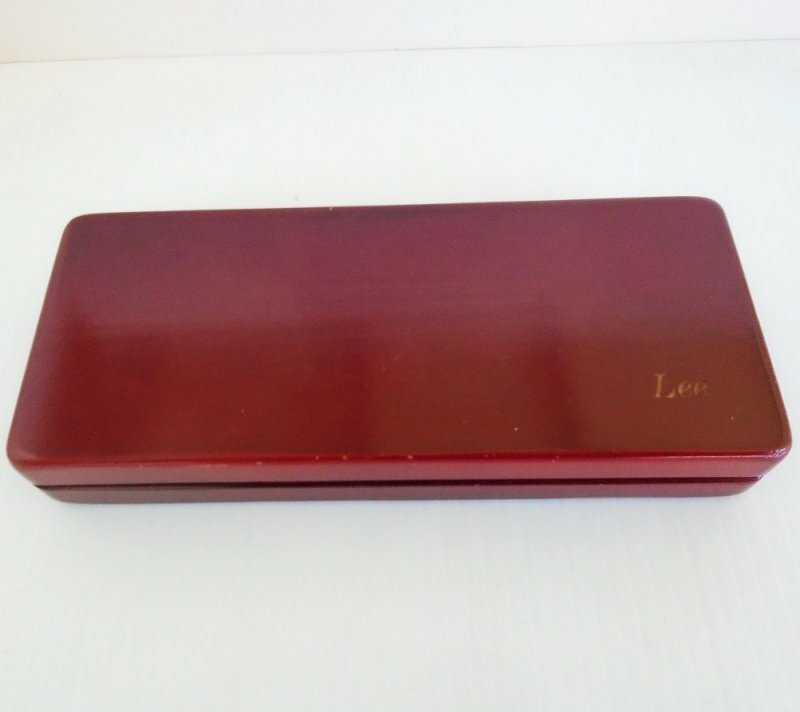 The cherry wood box measures 7.5 inches side to side, 3.25 inches front to back, and almost 1.25 inches tall. The box has a form fitted insert where the pen and opener rests. It is a hinged box. 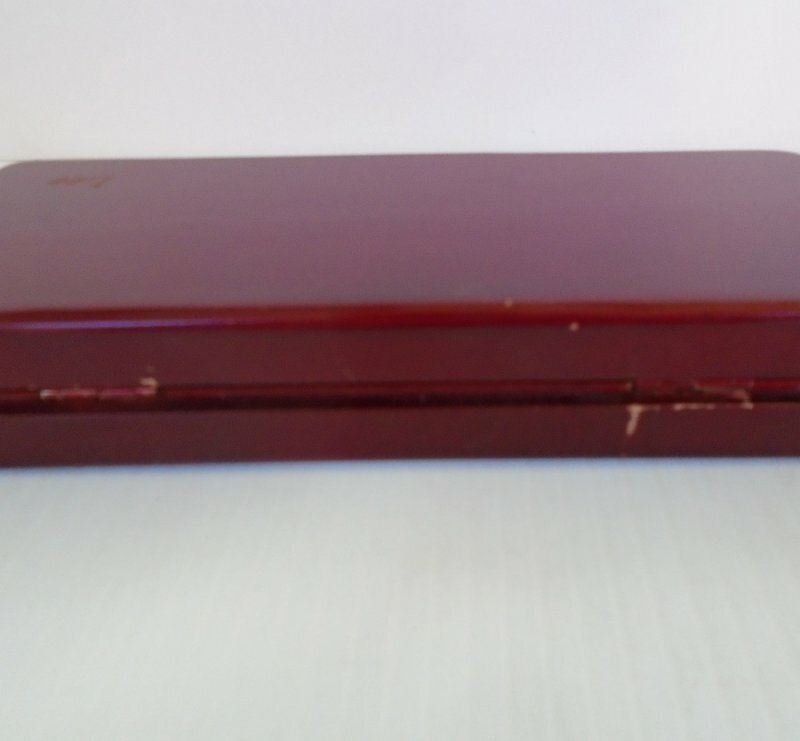 The box is also in wonderful condition but there is a small scratch on the back by one of the hinges. You should be able to see this in my last photo below this description. The set comes from my mother-in-laws estate. The exact date that it was originally obtained is unclear but my wife says she is sure it's from the mid 1960s as she was still living at home when her mother received the set as a gift. She doesn't recall her mother ever using the set and that's probably why there is still ink in the pen. Buyer to pay $5.20 USPS First Class Mail Parcel shipping charges. Delivery is from Northern California.